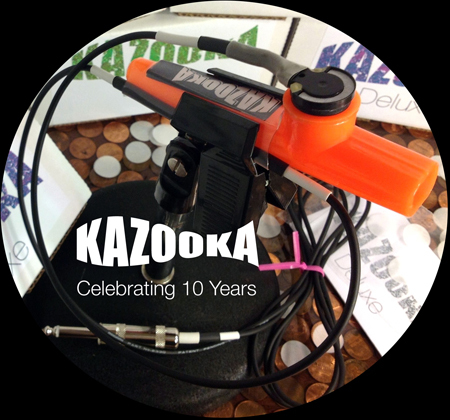 Kazooka is the original electric kazoo, hand crafted with pride in the United States since 2003. Our electric kazoos can be used in place of electric guitar or microphone with your existing equipment. They can be connected directly to guitar amps, effects pedals, microphone preamps and many computer sound cards. When you buy a Kazooka you are buying a professional musical instrument, not a cheap novelty. Our electric kazoos are hand crafted from high quality components by musicians for musicians. Our kazoos, membranes, pickups, cables and connectors have been selected for the best sound quality and durability with no compromises. Special attention has been paid to the voicing of our electric kazoos to assure that they cut through the mix with rich, focused tone while never sounding shrill or harsh. Thanks to our unique hand-crafted membranes, our kazoos sound better than any off-the-shelf kazoo, electric or not. Kazooka electric kazoos can be found in thousands of recording studios and are used by countless recording artists, touring musicians, producers and engineers world wide. 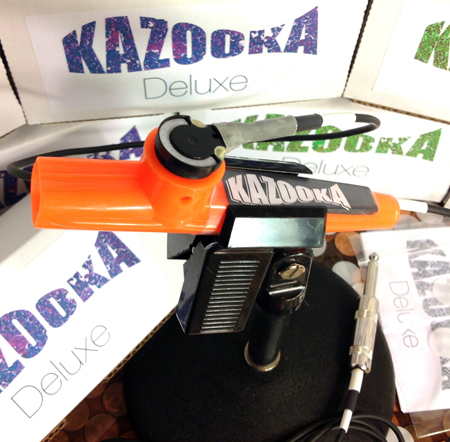 The new Kazooka Deluxe electric kazoo is the best sounding, most durable electric kazoo Kazooka has ever offered. An equally adept companion both in the studio and on the road; the deluxe is a new high water mark for electric kazoo. * Second generation removable pickup. * Microphone Stand mount for hands free play. * Side hole for creating tremolo and wah wah effects with your fingers. * Second generation kazooka pro membrane (the best sounding kazoo membrane ever made for this kazoo type). * Pickup end glows in the dark. * Anti-slip rubber grip on kazoo body. * Triple strain relief at every connection point. * Pickup decoupled from kazoo body by rubber to reduce handling noise and chance of feedback.